Viet Nam is struggling to find solutions, especially ‘green’ solutions to address challenges in water resources management with environmental damage, climate change and unsustainable water exploitation driving the water-related crisis. 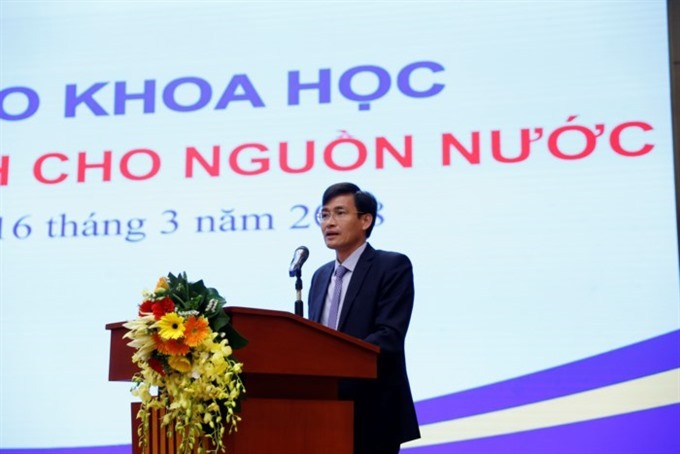 Natural Resources and Environment Deputy Minister, Trần Quý Kiên, gives a speech at the workshop on water resources management in Hà Nội on Friday. The statement was made at a workshop themed ‘Green solutions for water resources’ held by the Ministry of Natural Resources and Environment yesterday in Hà Nội. Deputy Minister Trần Quý Kiên said the negative impacts of climate change and unreasonable exploitation of water resources seriously affected water resources. “The workshop is held in response to World Water Day 2018 with the theme ‘Nature for Water’ to highlight the important role of nature in water resources protection and call for the application of available solutions in nature to address water challenges,” he said. He emphasised that the problem of water pollution was a hot topic in Việt Nam. “Discharge of untreated wastewater into water sources is frequent and widespread, resulting in pollution of rivers,” he said. The direct cause of these problems was initially determined to be the unsustainable exploitation and use of water resources, Kiên said. Recognising water resources protection was an urgent task to protect this precious natural resource, the workshop was also a chance for scientists, experts and policymakers in water resources management to share experiences and suggest solutions based on nature for water challenges, he said. Abedalrazq Khalil, senior water resources specialist of the World Bank, said Việt Nam had done much to manage its water resources wisely but was facing challenges. Water resource exploitation has exceeded safe levels, with Việt Nam’s wastewater treatment the lowest compared with neighbouring countries, he said. Việt Nam was also affected by climate change which impacts rice production and economic development. Aggregate impact could be more than five per cent of Việt Nam’s GDP by 2035, a substantial loss to Việt Nam’s economy, he said. According to his analysis, the frequency of floods in HCM City would increase. The overall economic impact could be expected to be much higher – calling for immediate action, the specialist said. According to him, Việt Nam should strengthen water resources management to respond to emerging water risks, better control pollution, protect the environment, invest more efficiently and align incentives with objectives. “Water is currently a major preoccupation for all Vietnamese and now could be an auspicious time to press ahead with change,” he said. “In Việt Nam, sustainable water management has become an urgent task as almost 70 per cent of water comes from outside the country,” said Dr Nguyễn Thế Chinh from the Institute of Strategy, Policy, Natural Resources and Environment. “The inefficient use of water, constant decreases in both quantity and quality and the impact of natural disasters has put pressure on the people and economic growth,” he said. Việt Nam has implemented several policies based on market access such as water tariffs, fees and charges for water use and exploitation, environmental protection charges for wastewater, compensation for damages due to water pollution. However, the policy implementation process has revealed inadequacy and failed to make use of advantages of market instruments in regulating the exploitation of water use, Chinh said.